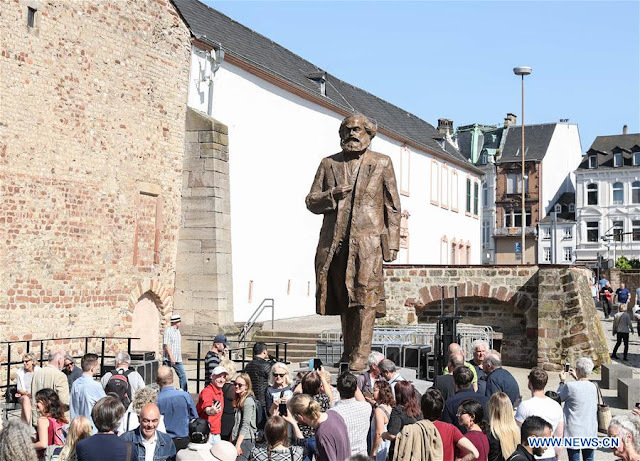 On May 5th the world celebrated the 200th anniversary of the birth of Karl Marx in the German city of Trier. It is hardly an exaggeration to say that the ideas of no one person of the past two centuries has had a larger influence on the course of history than Marx. It is also just as true to say that no one since Jesus has had his ideas so bastardized and misused as Marx. Marx's philosophy of emancipation was turned into an apology for state repression and social inequality at the hands of the Stalinists. Hundreds of millions of people had their impressions of Marx and his thought colored by that upside-down caricature. It is impossible to make an objective assessment of Marx and his work without that consideration. President Xi Jinping on Friday gave a high-profile speech praising Marx as the greatest thinker of modern times. He urged China's ruling Communist Party to go back to the roots of Marxism, and said the party would forever remain the "guardians and practitioners" of its theories. Students and most civil servants in China must complete mandatory courses in Marxism. There is historical precedent for a revolutionary movement being transformed into a doctrine rationalizing oppression. It should not be forgotten that Christianity, beginning as a messianic movement of slaves revolting against their oppressors, was in the next three centuries transformed into the state religion of the Roman Empire. One of the consequences of the bastardization of Marx at the hands of Stalinism has been the reaction against Marx from the rebellious generation of the 60’s who were disgusted by Stalinist scholasticism and conflated that with the ideas of Marx. The New Left embodied these contradictions between a revolutionary impulse and theoretical confusion. But the New Left’s adoption of what it considered a left alternative to Marx ran aground on the wreck of the protest movements of the 1960s. Nevertheless, those impulses from the 1960’s, while theoretically misplaced, at least had an emancipatory goal, a new world free of exploitation. The same cannot be said for some of the mutations of 1960’s era radicalism that we see today. These take the form of an identity politics hostile to the working class, a revival of ethnic nationalism and an overarching conviction that nothing fundamental can be done about capitalism. Many of these retrograde tendencies were on display at a celebration of Marx’s 200th Birthday at the Goethe Institute in New York. The Goethe Institute is sponsored by the German government and is the organization tasked with publicizing German culture internationally. While it is a positive development that Marx is no longer ignored by official German cultural institutions, he cannot be so easily assimilated. Unlike other icons of German culture such as Goethe and Schiller, Marx was a revolutionary whose heritage cannot be reconciled with the agencies of a bourgeois state. It is hardly surprising therefore that none of the speakers at the Goethe Institute panel on Marx had anything to say that would have been remotely recognizable by Marx had he dropped in. 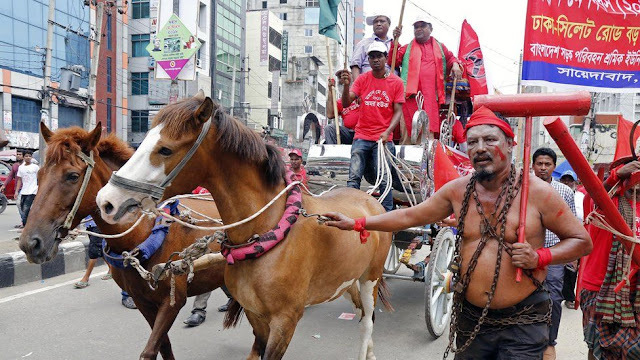 One panelist, a retired law professor claimed that the best examples of the socialist experiment in recent years could be found in the “Global South”. 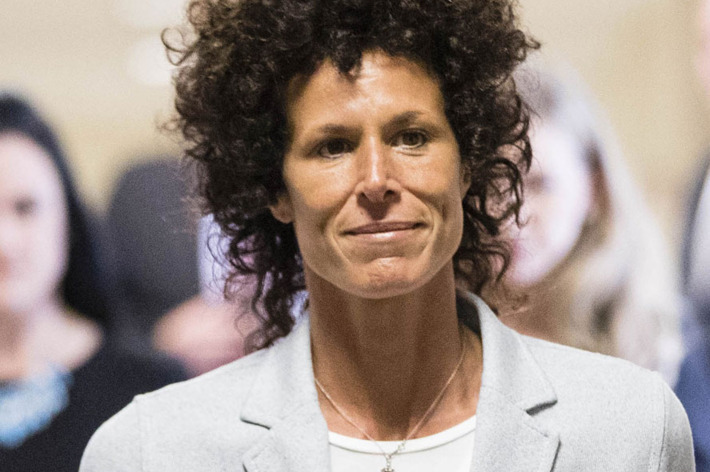 She mentioned in that connection Allende’s tenure in Chile before he was murdered by a CIA inspired coup, as well as certain attempts to institute “African socialism” by some of the nationalist leaders of Africa such as Julius Nyerere. This panelist did not seem very curious about why these experiments failed, while at the same time being dismissive of the far larger and longer experiment in socialism, the Russian Revolution, which she considered something primarily of interest to “white people”. Another panelist, a graduate student in feminist studies, barely concealed her hostility to Marx and Marxism as she went into a long diatribe on ‘gendered economics’. To his credit another member of the panel, the Marxist economist Anwar Shaikh, tried to gently correct the muddle introduced by the feminist student that we must start with gender as a primary category in all theorizing about society. He pointed out that you cannot start with gender until you have determined where gender lives. In other words, gender has a historical context and you cannot conceive of the emancipation of women without theorizing what an emancipated society looks like. But this was a minor note in a largely confused symposium in which the ideas of Marx were for the most part either ignored or conflated in an eclectic manner with all sorts of other notions that Marx would not have recognized as his own. Nevertheless, the fact that the Goethe Institute staged a celebration of Marx’s 200th birthday does indicate a recognition that Marx can no longer be ignored or dismissed as an alien presence. While it may be surprising for an economist who considers himself a Marxist to dismiss one of the pillars of Marx’s understanding of capitalism, the labour theory of value, almost in passing, it is not unusual. He is joined by many other economists and social scientists claiming to be Marxist or “post-Marxist”. Harvey claims that the labour theory of value is generally discredited. But in what sense? It is correct to say that the theory is not viewed with favour in economics departments, but that is for political reasons – the labour theory of value came, since Gray and Marx, came to be associated with socialism. Since academic economists, in general, did not want to be tainted with the socialist label they were at pains to distance themselves from the theory. "...those who attribute the difficulties of contemporary capitalism to the tendency of the profit rate to fall are, judging by this evidence of labour participation, seriously mistaken. The conditions point to a vast increase and not a constriction in surplus value production and extraction." Harvey’s chief complaint is that the LTFRP [the law of the tendency for the rate of profit to fall] and the theory of crisis based on it are mono-causal: it ignores other causes of crisis as well as counteracting factors, and its current proponents typically present it in a way that ‘exclude[s] consideration of other possibilities’. I will argue that this is just a strawman. I select Harvey as an example not because I think he is a particularly bad interpreter of Marx, but because he is one of the most widely recognized Marxist economic theorists working today. He is in fact one of the few people who take the study of Marx’s Capital seriously and has made important academic contributions to its dissemination. But he is typical of many of his colleagues in dismissing the theoretical heart of Capital. Marx's theories were also vulgarized by many of his admirers who turned it into a doctrine of inevitable collapse. This remains a popular, though completely misunderstood explanation of Marxism today. 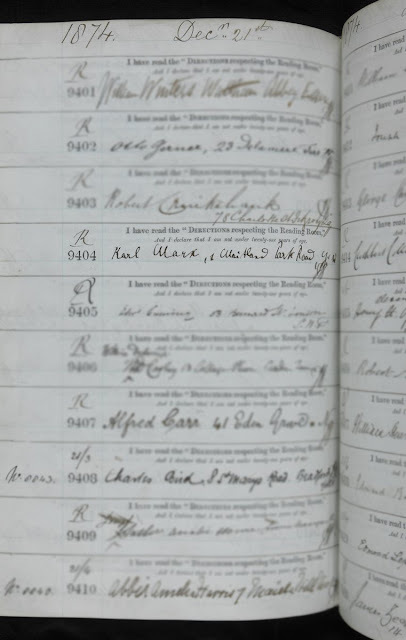 Marx's signature on a slip from the Reading Room of the British Museum where he worked on Capital. I should add that the Marxian dialectic remains an enigma to even the devoted few who will defend Marx's economic theories. This is a topic about which I have written extensively. Nor has there ever been an honest coming to terms by Marx's followers about the need to extend critical and dialectical thinking into areas that Marx barely touched. They forget that Marx’s original project called for 6 volumes and he was only able to complete the first volume of Capital. And that was just Capital. Had he lived long enough he undoubtedly would have had something to say about other areas of life. But the fact that Marx never did develop his ideas on psychology or art in any systematic fashion has led some of his followers to proclaim that these topics are either unimportant or irrelevant. There is also the question of whether Marx’s early “humanist” writings can be reconciled with his “mature” scientific work. I have always considered that debate something of an intellectual fraud. There is no question that as Marx matured his understanding deepened and he even reversed his ideas on a number of questions. But I think it is just as wrong to speak of some break between the early Marx and the later mature Marx, as if Marx stopped being a humanist in his mature years or that his scientific work was irreconcilable with his theory of alienation. That dichotomy was introduced by the work of the French ‘structuralist-Marxist’ Louis Althusser, who defended a “scientific” Marx shorn of the Hegelian dialectic. Althusser had his counterpart in the school of Marxist humanists, many of whom prospered in Yugoslavia, Poland and other Eastern European countries in the 1960’s. This group was looking for a source of opposition to Stalinist Scholasticism in the early writings of Marx. Unfortunately, they tended to identify the later writings of Marx with their Stalinist bastardization. These thinkers championed the early Marx’s writings on alienation which they viewed as completely divorced from his later “scientific” work and his theory of revolution. Many of these defenders of Marxist humanism later embraced nationalism and anti-communism. Finally, the Marxian political project is resting on hard times. The only mass political movements willing to identify with Marx are Stalinist parties representing the interests of tiny cliques of oligarchs. The Soviet Union is gone as are all the deformed workers states of Eastern Europe and the Balkans. Political movements that try to carry out the project envisioned by Marx are practically without exception tiny grouplets cut off from any mass movement. And these groups tend to veer off into increasing bouts of sectarianism while others dissolve their Marxist principles into opportunist cheering of militancy. Nevertheless, Marx remains key to understanding the 21st century. Of course, Marx did not and could not have anticipated the complex paths and detours taken by history in the 135 years since his death. Nor was Marx some kind of biblical prophet whose every prediction turned out be true. To be scientific is not the same as being infallible. It is necessary to supplement Marx with the work of other theoreticians, Lenin and Trotsky to be sure, but others as well, if one is to make sense of phenomena such as imperialism, the Soviet Union, fascism, the colonial revolution and the age of neo-liberal austerity. In the final analysis, it is impossible to understand our world today without resting on the shoulders of Marx. That is the basic ground for any theory of political and social emancipation. May Day 2018 in Bangladesh. This worker is depicting the status of the working class still in chains. David Harvey. Marx’s refusal of the labour theory of value, 2018. Unfortunately, most of what I have written in this area is in the form of a polemic against one sectarian group and their abandonment of dialectics. Nevertheless, I think there are some general lessons to be learned from those polemics for those with the patience to go through them.